The Strike King Silent 6 Xtra Deep Series has all the qualities of a 6XD but a quiter approach. 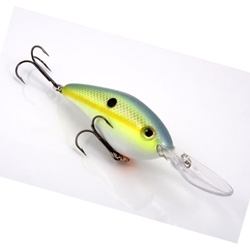 The Silent 6XD is a large deep diver crankbait with a unique curved bill that allows the bait to dive deeper and faster than most other deep diving crankbaits. This series does not have a rattle which creates a whole new presentation to deeper fish. The Silent 6 Xtra Deep Series is 1oz and dives 19 feet and beyond.